WIN a copy of A BLIND GUIDE TO NORMAL! Know what makes an awesome holiday gift? A signed copy of a new book. I'm here to help you out! 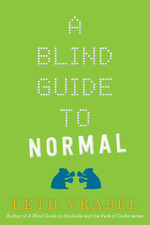 Enter to win a copy of A BLIND GUIDE TO NORMAL! Reviews for this new release have been incredible. School Library Journal says, "A sweet, thoughtful, and funny read. Hand this to fans of Vrabel's previous novels and those who enjoy a heartfelt tale without the typical saccharine coating." FabBookReviews shares that "A Blind Guide to Normal is yet another meaningful, heartfelt and strongly written children’s fiction title from Beth Vrabel. While you do not necessarily have to have read A Blind Guide to Stinkville to understand or appreciate this sequel, I would still recommend as the book and characters (you get to meet Alice and her family!) are simply wonderful. Any readers who have already read and liked Beth Vrabel’s previous titles, or those who enjoy the work of authors such as Lisa Graff, Leslie Connor, Kat Yeh or Donna Gephart might especially love A Blind Guide to Normal." Know what makes an awesome gift to an author? A reader review on Amazon or Goodreads. Increase your chances of winning a signed copy of A BLIND GUIDE TO NORMAL by sharing a link to your review of ANY of my books! Giveaway restricted to USA, due to shipping cost. Newer PostMore books coming to you soon! Older PostA Blind Guide to Normal!